Why not encourage a teacher you love, to relax with a wonderful book? You can do just that with this unique Red Apple Beaded Bookmark! It makes the perfect teacher gift! Pair it with a gift card from a book store, and it can be a gift from the whole class! This is the beautiful bookmark I have seen. It is shiny pretty and is very high quality. Thank you. 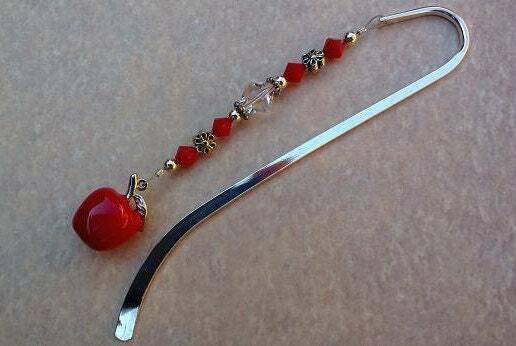 Beautiful bookmark! This is the third time I’ve purchased one of these for my son’s teachers’ Christmas gifts. Thank you! This is the second time I ordered from this shop. Would definitely recommend this for a Christmas gift for your child’s teacher! Thanks! This is going to make great gifts for my son's teachers. Thank u. Great looking bookmark, best gift for teachers! !